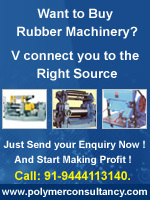 Add your company in India Rubber Directory. All the companies which are submitting their details through this form will be getting a free listing in india rubber directory. Sub pages are provided for interested members for Just Rs.1000/- . 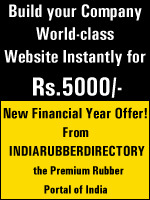 Choose premium listing checkbox if you want to your pages to be listed in india rubber directory. Please furnish your details and we will be touch with you. Banner ads comes in three size horizontal, vertical and small banners. Banner ads are provided for a nominal fee. Your banners can be fitted in homepage or main pages or inner pages or search pages. Choose banner ads checkbox if you want to your banner ads to be flashed in india rubber directory. Please furnish your details and we will be in touch with you. DRAFT Payment Details For Indian & Foreign Company to get the premium Listing you have to send DRAFT / CHEQUE on in favour of "TEAM WEB POWER" payable at CHENNAI on following address. C 47, IInd Avenue Anna Nagar,Chennai 600040.